It is a hard time to be a cotton farmer. Cotton is entering into new territory, a time when prices are low, and market share is declining. The Cotton Research and Promotion Program (the Program) has a positive story to tell, and a legacy to back it up, but must not get bogged down in the past. As the Program enters its fiftieth year, The Cotton Board is launching a new campaign directed at producers that will give them the confidence needed to renew their faith in cotton. The new campaign is a forward looking rally-cry for the cotton industry, letting the cotton-growing community know that the Program is pressing on and the possibilities are limitless. Cotton's future is renewable. Cotton prices have risen and fallen many times, but the demand for this natural, sustainable resource always returns with new possibilities and advances from research and promotion. The Renew Your Faith in Cotton campaign tells the story of research and promotion being done by Cotton Incorporated and introduces the cotton industry to exciting projects, such as innovations in cottonseed for food production and breakthroughs in fiber technology. The campaign will be executed through a variety of channels, including print advertising, radio features, and digital platforms. The print campaign will have six ads--three focused on cotton as the food of the future and three focused on cotton as the fiber of the future. The campaign was launched at the Mid-South Farm and Gin Show in Memphis and print advertising, radio, and digital advertising will continue to be executed throughout the year. The campaign ads ultimately drive users to the Renew Your Faith In Cotton Web site where they can learn more about the research behind each specific project. This site will be the designated place where growers can go to see how their Program funds are being used. As we enter cotton’s next 50 years The Cotton Research and Promotion Program has a renewed commitment to the hard work and dedication required to make cotton the preferred fiber for the world. 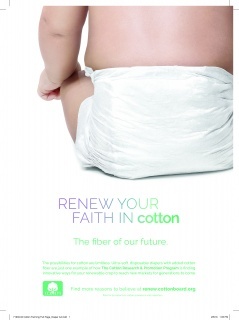 It's time to Renew Your Faith in Cotton. Find out more about the campaign at renew.cottonboard.org. It is estimated over 9 million acres of cotton will be planted in 2016. 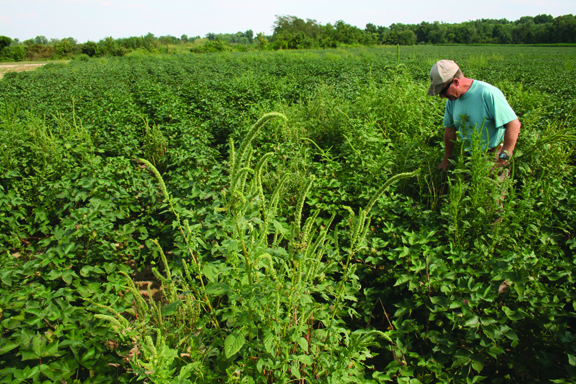 Many of those acres have experienced challenges with resistant weeds like Palmer amaranth(Palmer pigweed). This is a significant threat to production when just onepigweed plant in 60 feet of cotton row has been shown to reduce yield by up to 30%. This challenge facing growers was the stimulus for USDA seeking SePRO’s interest in developing Brake for cotton, as it represented a much needed new mode of action. "This is a new mode of action with excellent cotton tolerance and six weeks of pigweed control," says Dr. Bob Nichols, Senior Director of Agricultural and Envirnomental Research at Cotton Incorporated. "Cotton Incorporated was very active in getting this properly evaluated and off the ground," he said. Brake has been developed over the last 4 years in conjunction with the National Cotton Council, Cotton Incorporated, over 25 university researchers, industry expertsand growers. “Having the opportunity to develop Brake alongside the grower community has been invaluable for this new class of chemistry for cotton,” said Bill Culpepper, CEO SePRO Corporation. To learn more about the Brake story and the experiences of researchers and growers, go to brakeherbicide.com. Recent Price Movement - Cotton prices continue to be heavy. Recent values for the most-actively traded May contract have been setting a series of life of contract lows. The dip below support near the 58 and a half cent mark sent prices below 58 cents. Exports - The recent tick towards lower levels has occurred despite some positive news from export sales. Recent data included the highest sales volumes for the crop year. Export sales data are published with a slight lag, and the move below 60 cents/lb a few weeks ago likely were behind some of the bounce. Despite the uptick, sales for the crop year remain well behind the level from last year. The current volume of sales and shipments remains more than 30% behind the level at the same point last season. In future months, we likely will see the USDA’s forecast for exports fall further. The farther it falls, the higher ending stocks will be, and the more stocks that we have, the harder it is for prices to move higher. USDA Meeting Looks Forward - Although the next set of official USDA numbers is not due for another couple weeks, we got an early look at expectations for the 2016/17 balance sheet at the USDA’s Outlook Forum. At this meeting, the USDA releases a partial set of forecasts. Among the numbers released are global figures for production and consumption, as well as projections for a handful of world’s major cotton countries. In the coming year, in terms of production, the largest country-level change may be expected for China, where acreage is expected to decrease. The decline in China is projected to be more than offset by higher production in other countries. The country with the largest expected increase in their harvest is Pakistan, where adverse growing conditions last season are expected to ease in the coming crop year. Depending on the size of the changes, and other developments on the weather front, world production could be expected to be flat to higher in the coming crop year. Early U.S. Estimates - The USDA is predicting a slightly increase in planted acres than the results of NCC survey of intentions indicated. The USDA’s current figure calls for 9.4 million acres in 2016/17, while the NCC’s number was 9.1 million acres. In terms of production, an increase of about 10% is forecast, with the estimate for 2016/17 at 14.3 million bales. An increase in exports are expected to equal the increase in production and stocks are forecast to remain flat. If realized, this suggests prices will continue to trade sideways. Demand-Side Questions - The biggest questions for 2016/17 arise from the demand side of the balance sheet. The most important variables that the USDA considers when formulating forecasts for cotton consumption are price and the health of the world economy. Global economic growth is not great, so it may be tough to get much of a boost from macroeconomic conditions. Lower cotton prices are associated with stronger growth in mill-use. However, these are not normal times. Although cotton prices are much lower than in recent years, there was a period of several years when cotton was at an extreme disadvantage relative to polyester and this has resulted in an erosion of share. Whether or not current cotton prices in the high 50s will be enough to swing share back in a major way remains to be seen. A major challenge is low polyester prices. This is due in part to lower oil prices, but is also due to overcapacity in China. That overcapacity has made it a buyers’ market for polyester in China. This matters because China is home to 60-70% of world production and consumption of polyester, and with Chinese policies maintaining high premium prices for Chinese cotton, it has been an uphill battle for cotton’s share in the country. Expectations are that the Chinese government will become more aggressive in terms of moving their cotton by lowering their prices. The degree to which that happens can be expected to influence cotton’s share and therefore use in coming years.